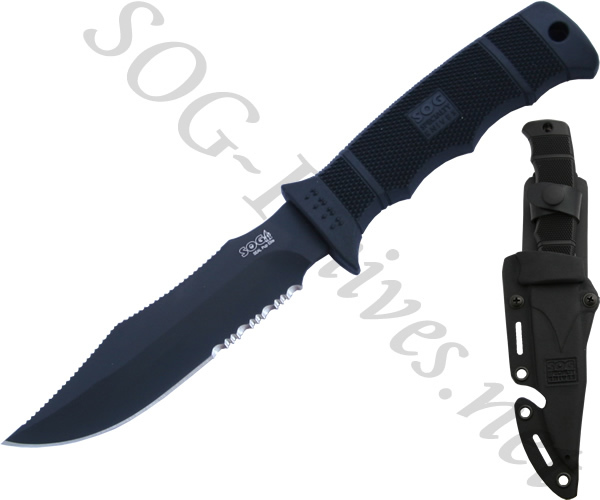 The SOG SEAL Pup Elite model E37T has a partially serrated black TiNi coated AUS 8 stainless still blade. At .185 inches thick the blade of the Pup Elite is high quality and used by many of the worlds military forces. The textured Zytel handle has deep finger grooves for good grip. A Kydex sheath is included. Own a SOG SEAL Pup Elite Black TiNi Knife E37T? Tell us how you like it! Got a question? Ask! Somebody will answer!